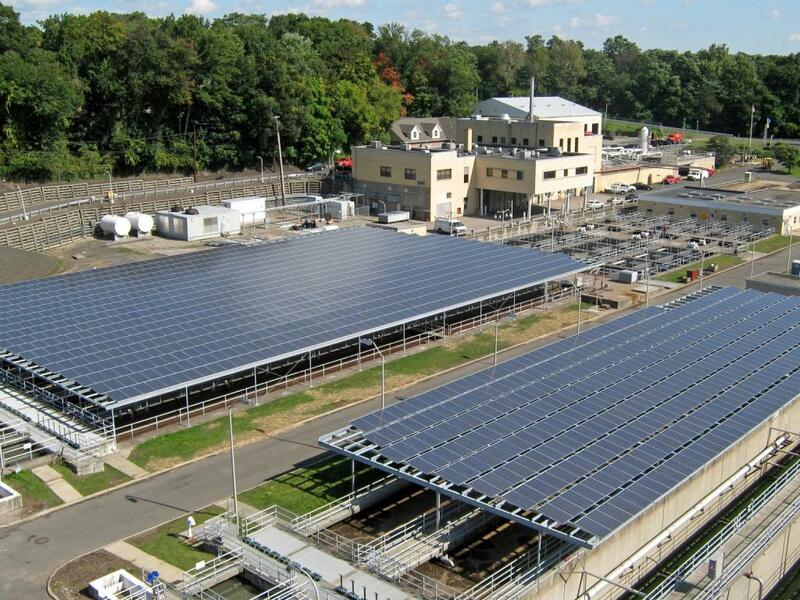 The Northwest Bergen County Utilities Authority has installed a 334 kW Solar Generating System at its wastewater treatment plant in Waldwick, NJ. The System features 1,547, 216 watt modules manufactured by Sharp. The panels were erected above the plant aeration tanks in much the same manner as a parking facility installation in order to minimize the use of vacant land on the site. The System was installed in 2009 and became operational in October of that year. The installed cost of $2,320,080 was financed by Clean Renewable Energy Bonds (CREBs) issued by the Bergen County Improvement Authority (BCIA) and guaranteed by the County of Bergen. Annual debt service is $180,000. The Authority also received a grant from the New Jersey Clean Energy Program's CORE Rebate Program in the amount of $630,537. During the first year of operation, through October of 2010, the system produced about 442,000 kWh of electricity amounting to about 5.5% of plant requirements with an estimated saving of $40,000 in electric power cost. In addition, the Authority earned $294,000 from the sale of Solar Renewable Energy Credits (SRECs) for a net profit of $154,000, excluding the CORE Rebate. A live report of system operation can be viewed here.